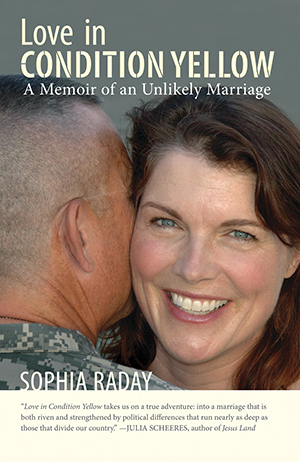 Berkeley peace activist Sophia Raday never imagined she would fall in love with an Oakland police officer and major in the Army Reserve, much less marry one. Barrett is loving and loyal, but in his world a threat lies around every corner, and so he asks Sophia to stay in Condition Yellow always aware that her life may be in danger soon. Sophia’s heart-wrenching yet humorous narrative about coming to a new understanding of peace and partnership gives hope for healing the deep divisions in our country, from the front lines of a most unusual union.